I should have known when we boarded the bus that morning I was out of my league. After all, a bird watching tour wasn’t exactly something I had on my bucket list. To be truthful, I couldn’t tell a black-billed magpie from a black-bearded pirate. Suddenly, one day, it became my obsession. Lured by pictures sweeping across my computer screen of magnificent eagles in flight and sunny marshes crowded wingtip to wingtip with snow-white birds, I decided the city wasn’t the place for me to be. 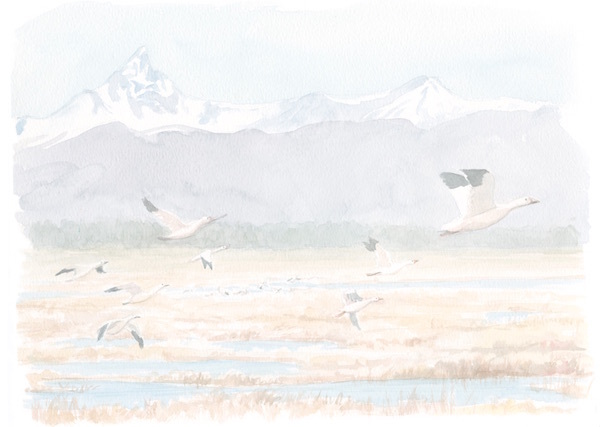 I found myself heading south for the Winter Wings Festival, an annual event that draws birders and photographers from around the country to Klamath Falls to observe migration along the Pacific Flyway. I thought I’d found just the right field trip for me: “Laid Back Birding.” No crack-of-dawn “Extreme Birding” treks for this night owl. I envisioned a group of us clad in our pith hats and khaki vests, listening intently while a knowledgeable guide detailed the basics of birding in the Klamath Basin. He would point, and we would nod. I had my notebook and pen at the ready. We novices would learn so much and maybe even snap a picture or two to show the folks back home. As we headed off to the Lower Klamath National Wildlife Refuge, along the Oregon-California border, I noticed the other tour members were slightly better equipped than me. They had field guides and checklists. They had expensive-looking binoculars and spotting scopes. They had camera lenses longer than my forearm. They had apps. Before we even reached the refuge, the bird-spotting fervor began. “Nine o’clock! 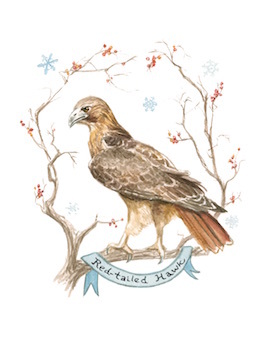 Red-tailed hawk!” Twenty-nine faces flocked to the windows on the left side of the bus. “It’s right there, on that fence post!” I couldn’t see the hawk. I couldn’t even see a fence post. I squinted and strained. Nothing. What? Where? And who’s Ross? I mumbled something about getting that lasik surgery and hid behind my woefully inadequate camera. “Northern pintail! Common goldeneye! 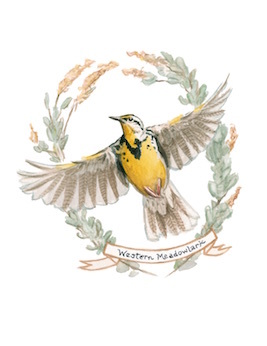 Western meadowlark!” the birders called out in rapid-fire succession. All around the clock I looked. It was dizzying. Boy, these people were sharp. As the tour continued, I marveled at invisible birds. To make matters worse, it was raining, and that rarely happens in this high desert haven that boasts 300 days of sunshine a year. I should know—I grew up there. But I also knew, deep down, that the moisture was badly needed. In fact, just the day before, Oregon’s governor had declared a drought emergency in Klamath County, in the middle of winter. The region was experiencing one of its driest years on record. The Klamath Basin is a land of contrasts and conflicts. Bordered on the west by the Cascade Mountains with tall stands of ponderosa pines and Douglas and white firs, and on the east by a semi-arid plateau dotted with jack pines, junipers and sagebrush, it’s home to Oregon’s largest body of fresh water in Upper Klamath Lake. Klamath Marsh, Agency Lake, Lake Ewauna, Tule Lake and Clear Lake account for the other nearby bodies of still water, in addition to numerous other waterways, including the Klamath River. The wetlands support more than 275 species of resident and migratory birds. Following a string of severely dry years, the Basin has become embroiled in a battle over water rights. 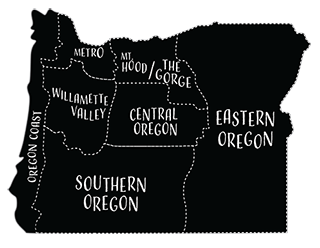 Protected endangered species (coho salmon, and Lost River and shortnose sucker fish), local tribes, and farmers and ranchers all have a stake in those resources. 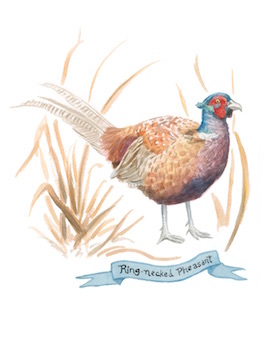 So do the nearly two-million winged inhabitants of the area’s six national wildlife refuges. Eighty percent of birds on the Pacific Flyway pass through the Basin during migration, and half of those stay to rest and feed for a while during their travels between Canada and Alaska and California’s Central Valley. This home away from home for migrating birds hasn’t always thrown down the welcome mat, though. Until about 100 years ago, Lower Klamath Lake was a sprawling 94,000-acre marshland, fed by spring overflow from the Klamath River. In 1905, the U.S. Bureau of Reclamation initiated the Klamath Project to convert those wetlands into family farms for growing crops such as grain and potatoes. Much of the lake was drained and replaced with a network of irrigation canals and ditches. Not everyone saw this change as progress. William L. Finley spent the spring of 1905 in the Klamath Basin documenting the abundant wildlife, calling it “the most extensive breeding ground in the West for all kinds of water birds.” One of Oregon’s most influential conservationists, Finley was alarmed at the tremendous loss of bird habitat. Further, illegal hunters were shipping tens of thousands of dollars-worth of bird plumes to New York milliners and literally tons of waterfowl to San Francisco restaurants. He urged then-President Theodore Roosevelt to act, and in 1908, Roosevelt set aside more than 80,000 acres as the nation’s first waterfowl refuge. At the same time, the California Northeastern Railway company was completing its line to Klamath Falls, and through a contract with Reclamation, it created an embankment that severed Lower Klamath Lake from its source. One channel was left to fill the refuge’s marshlands. In 1917, as 175 homesteaders filed for tracts of project land, the head gates to the channel were closed. Lower Klamath Lake began to evaporate, revealing a fertile lakebed well-suited for farming. Through a series of executive orders, presidents Woodrow Wilson and Warren Harding whittled nearly 30,000 acres from the refuge and turned the land over to more homesteaders. By the early 1920s, the refuge had become little more than a dustbowl, unable to support nesting migrating birds. Thousands died of alkali poisoning, and the dried peat bogs burned continually, sending ash clouds raining over Klamath Falls. Finley aired his outrage in his 1930 documentary, The Passing of the Marsh Lands . Finally, a Reclamation engineer proposed a solution—drilling a tunnel from nearby Tule Lake under Sheepy Ridge to deliver agricultural water runoff to the thirsty refuge. In 1942, water began flowing through the 6,600-foot concrete tunnel. A few years later, the Ady Canal was built to restore the refuge’s water supply from the Klamath River. By the mid-1950s, an estimated seven million ducks, geese, cranes, swans and other migratory birds were visiting Basin refuges each year. When the twenty-first century arrived, it brought another, unrelenting challenge—drought. For the past four years, a combination of warmer-than-average temperatures and lighter precipitation has decimated the mountain snowpack that feeds the Basin’s wetlands, leaving water at a premium. It’s been two years since the refuge has received any water from the Klamath River, and its marshes have been drained back into the river each spring for irrigation use and to keep the river and connected Upper Klamath Lake at federally-mandated water levels for endangered salmon and suckers. It’s as though history is repeating itself. As the white pelicans, “dancing” grebes and shorebirds arrive to breed in spring and summer, the marshes morph into mere ponds. Cracked mud and empty canals remain where ducks and geese once swam. Birds peck in the muck where they used to dive for fish. Great egrets stretch their long legs in the parched bed of a lake that has all but disappeared. Relief has been sporadic, when Reclamation releases water back into the refuge at varying times and amounts, based on what’s available. The Basin’s wildlife refuges are lowest on the priority list for water allocation. When water is scarce, more birds crowd into tight spaces, and outbreaks of avian cholera and botulism spread exponentially, paralyzing and killing thousands of mallards, ibis and other waterfowl. Although water from the Tule Lake tunnel is delivered to the refuge in the fall, in time for the peak migration season, the amount has been decreasing steadily for years. To this newbie, birds seemed to be everywhere, but the long-term health of their habitat and its impact on the number of returning migrators was weighing on everyone’s minds during the festival. Field trips to the refuge were scaled back to avoid stressing overwintering wildlife using limited wetlands. Any rain or snow on the day of my visit was a blessing. Then we all spotted it. A lanky coyote, its fur matted from the rain, sauntered along the road ahead of us and disappeared into a ditch. In a sudden rush, a flurry of pheasants bolted from the tules, with the coyote close behind in hot pursuit. “Wheee…!” came a chorus from the bus. Coming up empty, the coyote made a loop and headed back into the ditch. Moments later, another dozen pheasants swooshed from their hiding places. Again and again, the poor coyote attempted to catch its lunch, but with no luck. The pheasants were just too fast. After many valiant but fruitless efforts, it finally gave up. In this game of life and death, the final score: Pheasants-86, Coyote-zip. Our school bus chugged away, leaving the loser standing alone in a field, tired, hungry and frustrated. Things were beginning to get interesting. As we navigated a maze of gravel roads alongside canals feathered with cattails and shallow marshes ringed with willows, some species of birds were impossible to miss. 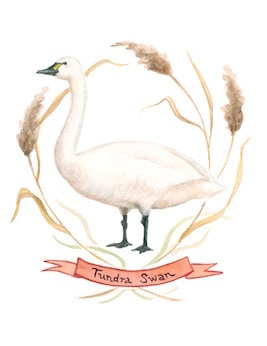 Flooded grain fields were filled with enormous flocks of tundra swans. Some sailed along, delicately dipping their long necks into the water for food, while others whooped and caterwauled nonstop. As many as 30,000 of these regal birds visit the refuge during migration, settling in the marshes and crowding the skies. Avian air traffic control gets a bit hectic on the refuge in winter. On this drizzly morning, arrivals and departures were humming along. 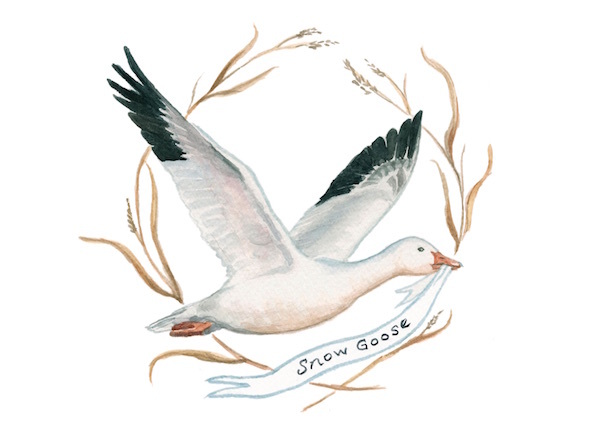 And the captains of the sky, clearly, were the snow geese. They reigned over the refuge in giant funnel clouds flying ‘round and ‘round, flashes of white against charcoal skies. Their throaty cries drowned us out as more geese heeded the clarion call, lifting their black-tipped wings and ascending from the water to join in the spectacle. There’s something almost transcendental about watching birds winging across the soft, hazy palette of a winter sky. En masse, in duets or solitary, they embody an ageless aire, a perennial reminder that the cycle of life goes on, just as it always has since the beginning of time. Our birding guide, Marshal Moser, a certified wildlife biologist and manager-naturalist at Lonesome Duck Ranch, shared nuggets of information along the route, discussing the remarkable capabilities of the raptors that swooped over the fields and marshes around us. Their physical characteristics provide them with excellent vision and hearing, not to mention deadly strength. “An eagle can break a broomstick in two with its talons,” he said. As we nibbled on turkey sandwiches, the raptors eyeballed unwitting waterfowl from their lofty perches, poised to make a speedy dive and pluck a duck from the ground for a tasty meal. Our lunchtime entertainment was a first-hand lesson in the realities of the food chain. By now I was smiling. Sharing the surprises of the refuge together had bound a new group of friends. Not a bad way to spend Valentine’s Day, I thought. And then it happened. I fell in love. 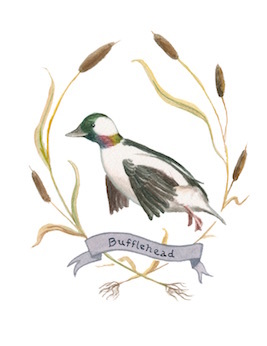 With a bufflehead. “Who’s that?” I asked, pointing. Oops. Well, color me ruddy. I embarrassed myself again. No matter. I was enchanted by the antics of this little bird with the conical head and rubber-ducky body that glided cheerfully down the canal beside us. It would vanish suddenly, diving for food, and then—bloop!—reappear just as quickly, like a black and white bobber. At the slightest scare, it would take off skittering across the water, flapping its tiny wings madly. As our auto-bound Audubon society returned to Klamath Falls, the show was about to have a finale. Black-crowned night herons, clustered along the Link River, grabbed the attention of several hawk-eyed tour members. I’ll bet they were neat. Of course, I couldn’t see ‘em. After four days of field trips, workshops and presentations on everything ornithological, I sensed the refuge drawing me back like a magnet. When all of the festivalgoers had gone home, I returned to the Lower Klamath on my own, armed with a peanut butter and jelly sandwich, a pictorial guide to local waterfowl and a brand new telephoto lens. Uh oh. I was becoming a bird nerd. My heart soared when I spied a pair of bald eagles nesting high in a willow tree. I clicked photo after photo as one eagle stretched out its glorious six-foot wingspan and sailed away on the wind. Eagles are not hard to find in the Klamath Basin, which hosts the largest population of wintering bald eagles in the contiguous United States. More than 500 arrive from the north in late November and December. Witnessing them in flight conveys just how large and powerful these raptors are. But it wasn’t that long ago eagles were in peril. When America’s leaders chose the bald eagle as our national symbol in 1782, there were about 100,000 nesting eagles in our country. Their population started dwindling in the mid- to late-1800s when many were shot because of fears they would kill livestock. Around the same time, eagle habitat started disappearing. Post-World War II use of chemical pesticides, including DDT, and lead poisoning from ingesting waterfowl containing lead shot, furthered the eagle’s decline. 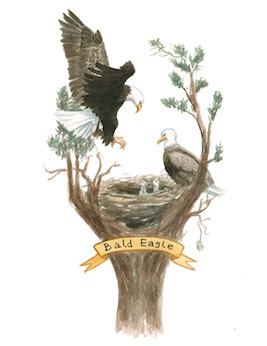 Only 417 nesting pairs remained by 1963, and the bald eagle was in danger of extinction. Listing under the Endangered Species Act in 1978, banning of DDT, and diligent recovery efforts have helped bring the birds back, and today there are close to 10,000 nesting pairs in the lower forty-eight states. In 2007, the bald eagle was removed from the list of threatened and endangered species. There I was, surrounded by a bounty of breathtaking eagles—so many I lost count—whose very survival depends on the fish and waterfowl of the wetlands. For three more days, I explored the Lower Klamath refuge. It was like searching for treasure; I never knew what was waiting around every bend in the road. Much like the migrating birds, it was my time to move on. I took one last look around at the desert browns, marshes swathed in crimson dock and orange dodder, violet mountains folding into one another in the distance and vast stretches of still water tinted with whatever hue the sky chose to be at any given moment. This is a good place to call home. Tranquil. Timeless. As I drove away, a steely-eyed hawk was watching from atop a road sign. He had a message for me. It read, simply, “STOP.” Oh, how I wish I could. I made a promise to that hawk, and to the coots and cranes, the herons and harriers, the little buffleheads and all the birds whose names I had yet to learn. I’ll be back next year. The question is, will they? Legislation currently before Congress could spell relief from the serious water issues affecting the Klamath Basin’s wildlife refuges and other stakeholders. The Klamath Water Recovery and Economic Restoration Act, SB133, would enact into law the Upper Klamath Basin Comprehensive Agreement and would provide the means to implement the 2010 Klamath Basin Restoration Agreement. SB133 could provide $500 million in overall funding and could allocate 35,000-60,000 acre-feet of water seasonally to the refuges. The bill must pass both the Senate and House before the end of the year to be signed into law. 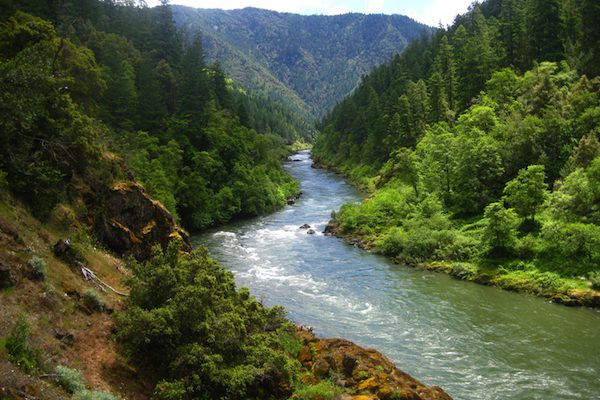 Find out how to help at Klamath River Restoration (klamathriverrestoration.org). Track the bill at govtrack.us. Lower Klamath National Wildlife Refuge is 20 miles south of Klamath Falls, just off Highway 97 on Highway 161. It’s open daily from sunrise to sunset. A Visitor Center featuring wildlife just across the border in Tulelake, California displays, books, video presentations and more is located at 4009 Hill Road, 4 miles south of Highway 161. Hours are 8 a.m. to 4:30 p.m. Monday through Friday and 9 a.m. to 4 p.m. Saturday and Sunday. The center is closedon Thanksgiving, Christmas and New Years Day. There is no fee for the Visitor Center or the refuge. For more information on all six Klamath Basin refuges, go to fws.gov/klamathbasinrefuges or call 530.667.2231. The 37th annual Winter Wings Festival is slated for Presidents Day weekend in February in Klamath Falls. The event includes field trips, workshops, youth activities and presentations on birding and photography. Registration begins in early December. For more information and schedule updates, go to WinterWingsFest.org or call .877.541.BIRD. Wonderful story lots of real information. Thanks for writing this! Fascinating and fun article. It does cause one to want to experience the tour. The art work is very nice and adds to the story. What a fantastic account ! 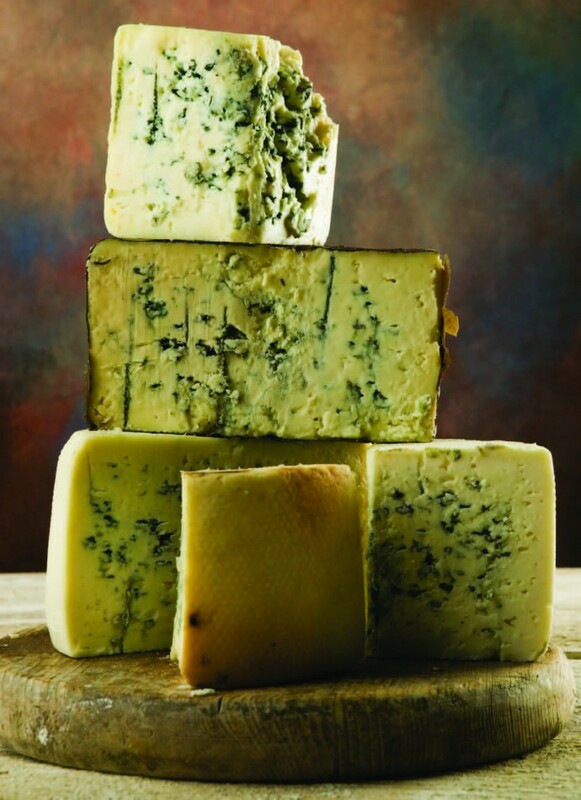 Your superb style really takes us along for the tour and captures the whole story of the region – thank you !! Will have to take the tour next year – very interesting.